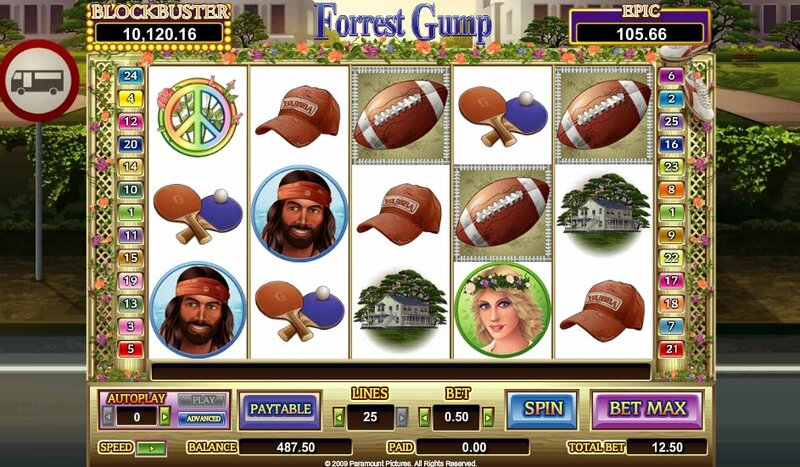 As with the comedy-themed slot from slot developer Cryptologic, Ferris Bueller’s Day Off, this big movie tie-in from the same developer, Forrest Gump, features lots of icons from the film and the chance to win big in its Hollywood Jackpots progressives. But that’s where the movie theme kind of ends. In this 5-reel, 25-payline online slot, the images from the multi-Oscar winning movie are all rendered in ink. That wouldn’t be so bad if everything in this game actually resembled what you remember from the classic film about an Alabama simpleton shaping 20th Century America. On the reels we get the images of Forrest (looking like Harry Connick Jr.), his lifelong love - Jenny (looking like Pamela Anderson) - and his old army commander, Lieutenant Dan (looking more like one of the Bee Gees), while there are also images from the film such as a football, Forrest’s ping pong bats, Forrest’s Mom’s house, his army helmet, a baseball cap, a peace symbol, and yes, a box of chocolates. Five Forrests pays out the max jackpot of 5,000x your line bet. Forrest is Going To Run Wild Over You! The Wild is the image of Forrest on the bench, and, like the Wilds in Ferris Bueller, only appears on Reels 2, 3, and 4. It substitutes for all regular symbols other than the Scattered Box of Chocolates. Free Spins are Like a Box of Chocolates...You Never Know How Many You're Gonna Get! When three or more of those appear anywhere on the reels you’ll trigger the – wait for it – ‘Box of Chocolates’ feature. Here, you’ll be presented with a 3x3 grid of chocolate boxes – simply pick matching chocolates to win ‘free drops’. You’ll then watch free spins on a 3x3 grid of reels. Your spins will start and a winning combo will disappear and symbols above fall into their place in classic ‘Cascading Reels’ style. 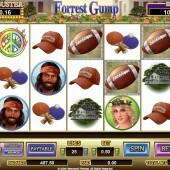 Meanwhile, the ‘Run Forrest Run’ feature is awarded when you land 3, 4 or 5 Footballs from left to right on the reels. The bonus round re-enacts the classic football game where Forrest triumphed by being, er, just faster than anyone else. As Forrest tears off down the field, steer him left or right to dodge opponents and win cash for every 10-yard marker he passes without being tackled. If Forrest scores a touchdown you’ll win a bonus prize. Forrest Gump is part of Cryptologic’s Hollywood Jackpot range so there’s a juicy progressive up for grabs. Triggered at random (although easier to hit if you’re playing at the bigger betting spectrum) you’ll get to choose up to four film reels on a grid. Match symbols to move up the jackpot ladder – the higher you go, the better the chance you have of hitting the big one. This slot had massive potential but appears to have decided not to fully take advantage of the movie's name and awesomeness. It's still a solid slot with fun bonus features but for such an epic movie it is a bit of an anti-climactic slot. Something went a little wrong here. It seems strange that Cryptologic bagged the rights to do a Forrest Gump-themed slot but didn’t acquire the rights to display any film stills or clips from the film. The graphics are really badly rendered – I mean, really badly – and there’s even a bad impression of Forrest when you trigger the Box of Chocolates bonus. If you like interesting movie-themed online slots with healthy jackpots, you could do far worse than try Cryptologic’s Ferris Bueller’s Day Off, as mentioned at the top of the review (so good it bears repeating) with actual real images from the film, while OpenBet’s Highlander slot faithfully recreates similar ‘80s thrills.